This is the third and final installment about out March 2018 unsupported tandem tour. See part one here and part two here. Distance 95.7 miles. Our route at Strava is here and our photos are here. Today was Mary’s birthday, which was a cause for celebration, but we woke up pretty tired. The third day of a tour is always hard. The adrenaline of the tour start is long gone. With heavy legs we pedaled around the outskirts of Brawley to Starbucks, out by the Wal-Mart, for morning coffee. Being a Tuesday, kids were walking to school. Nobody paid attention to us. They were focused on lugging themselves and their backpacks to class. 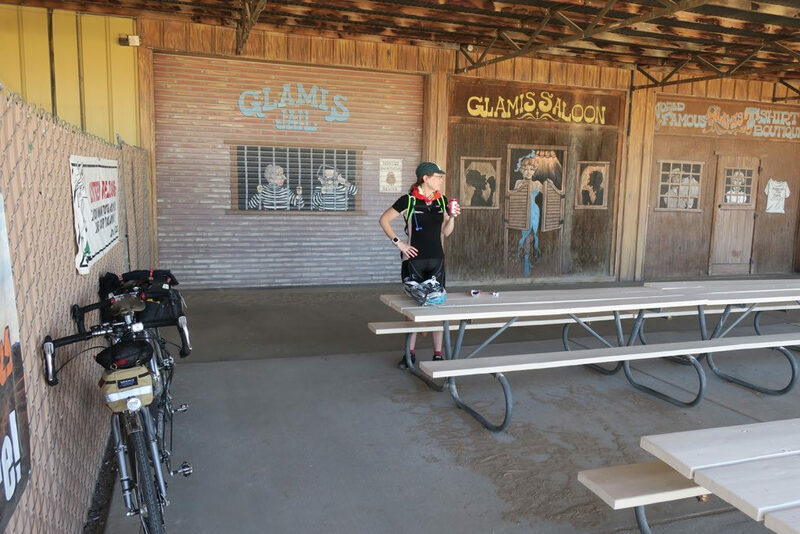 The route today appeared to have just one stop, the Glamis Beach Store in the dunes area at mile 30, and prepared food wasn’t assured. I went into Wal-Mart and got a 12-inch turkey sub and a bag of Fritos for a lunch somewhere along the way. We were also now on the Adventure Cycling Association’s Southern Tier route for the rest of the trip to Phoenix. 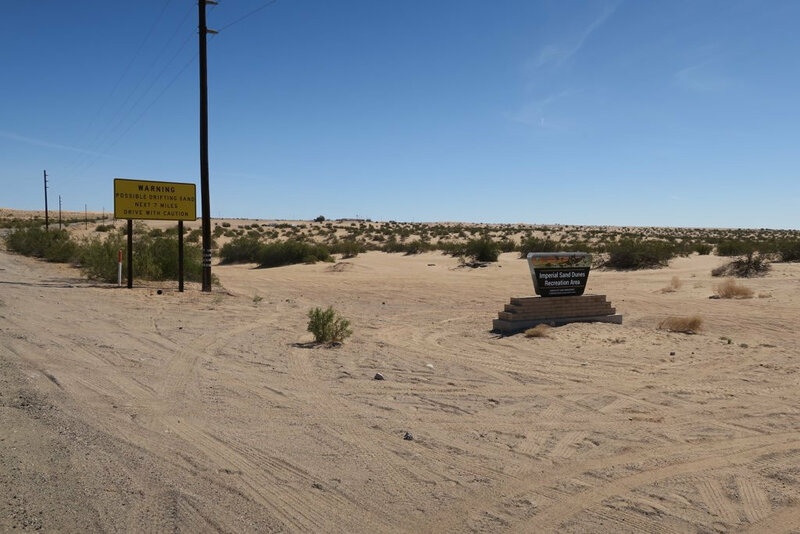 We climbed up the little steep road to the visitor overlook – really just a shade stand, parking lot and restrooms – and looked out at pristine sand ridges for miles around. A couple of folks took off in a dune buggy and an offroad motorbike, and disappeared over the nearby rises. 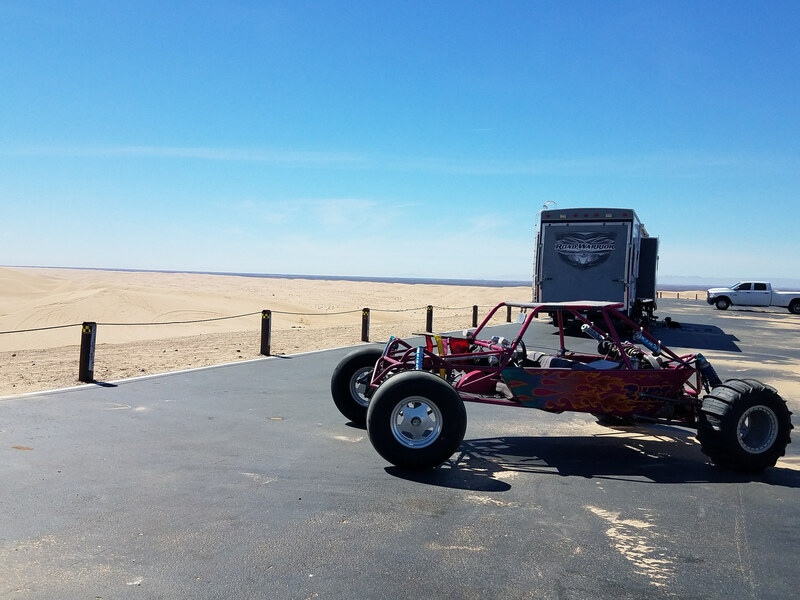 The Glamis Beach Store is the local gathering point for the sand crowd, with a big general store and RV lot, and not much else. A few dune folks were hanging around but it was pretty quiet. We bought drinks and chips and hung out for awhile, still trying to get our pedaling motivation in gear. We left close to noon and still had 65 miles ahead. It was time to get some miles behind us. Mary bought a garish Glamis bandana to put around her neck, which was getting sunburned. The store was the last bit of shade we’d have the option to enjoy for the next 43 miles, as we traversed through bare desert terrain on what was a busy area highway. At the summit, near Buzzards Peak, we rode through a Border Patrol station, where the officer who talked to us offered free water. We gladly accepted. We found out later they gave water to all the touring cyclists who came through. The section at the top was a moonscape with a lot of short steep rollers, and they even signed it to make sure we got the message. Traffic wasn’t heavy but there was enough to indicate that it was a well-traveled route. People in Blythe would complain to us the next day that the road is dangerous. I would agree it is not the best for drivers because of limited passing opportunities. We had no problems, though. I suspect our timing was good. Lunch was a bit of a sad affair. I gave up trying to find some shade and we pulled over at a gravel flat area off the road and laid the bike down. I got out our sandwich, cut it in two with a plastic knife, and we ate it standing up in the blazing sun. There was one of those little roadside memorials to someone who had died in a traffic accident, and not much else. We took our time at the store at Palo Verde, mile 73, which had real shade! A couple of miles later we got off the highway and rode via the grid of flat local farm roads for the final miles. Blythe, at least from where we came into town, looked pretty humble with few dinner options. We asked at our hotel, the Hampton Inn, and the desk staffer directed us to the Baja Fresh at the gas station, which says something. There was also a diner nearby but that didn’t appeal. We should have stopped at the Ralphs as we entered town and gotten dinner to eat in the room, but instead we surrendered to our fate and ordered Dominos pizza. I wished we had a better way to celebrate Mary’s birthday. Distance 116.5 miles. Our route at Strava is here and our photos are here. We returned to Ralphs for coffee before leaving Blythe. The folks the Starbucks counter warned us about the road we took the day before. 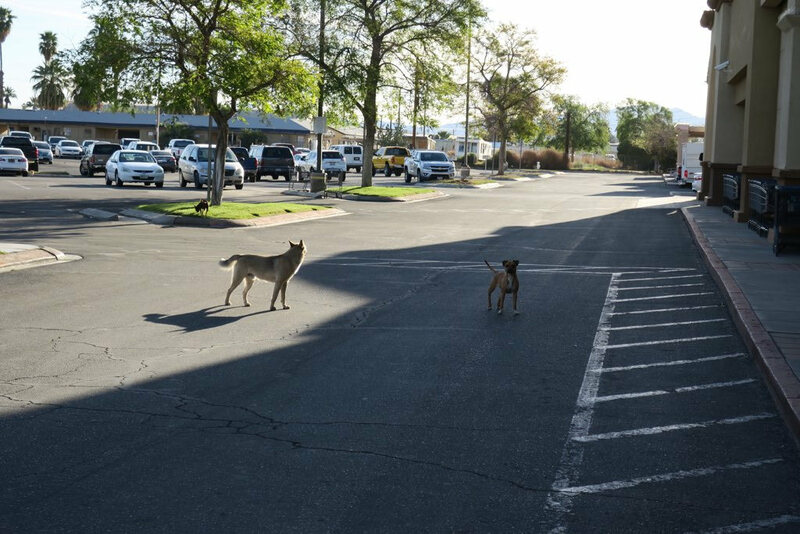 We also watched a group of stray dogs wander around the parking lot. Today was going to be an interesting one, with two mandatory stretches on I-10, and a lot of miles ahead. The spring warmth was upon us as well – there wasn’t much need for jackets and warmers. As we neared the exit from town, a rider with panniers on a Surly Disc Long Haul Trucker appeared and we stopped to talk. It was Jon Muth, a recent college graduate from Ellicott City, Md. (near Baltimore) who was on a solo trip to Florida. He had flown out to L.A., bought his Trucker, and rode to San Diego before joining the Southern Tier route. See Jon’s blog for details of his amazing trip to Florida and beyond. 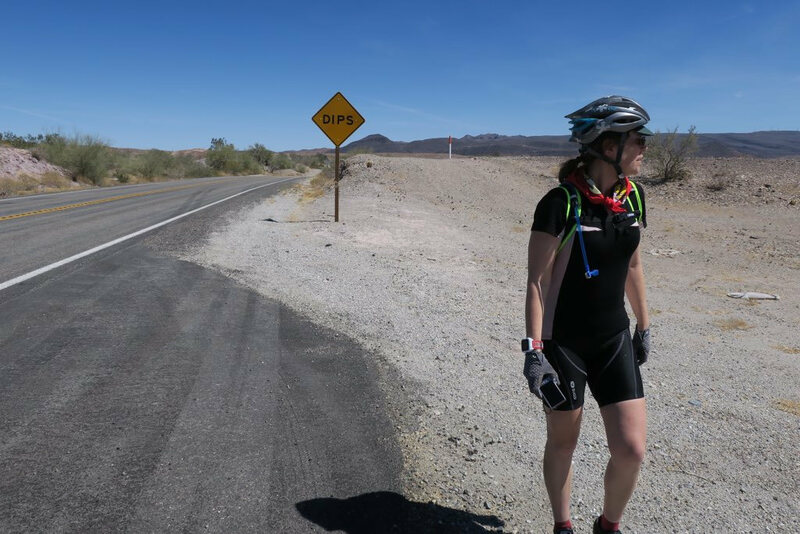 We all took off together for the pedestrian bridge across the Colorado River into Arizona, and began climbing up I-10 to our first summit at 1,702 feet and then a run through Quartzsite. Jon fell back but caught us when we stopped briefly at the weigh station, and then we rode down into Quartzsite together. There was no reason to stop and we got back out on the I-10 shoulder for the 11-mile segment up to US60. Jon again dropped back as we tried to make short work of the interstate section. The desert terrain was even more pronounced now that we were past the Colorado River, with small cactus dotting the hillsides. A work zone closed the right lane for a few miles, which gave us some respite. There had been a crash and a cleanup crew was on the scene of what appeared to be the remnants of a load of generic laundry conditioner; we saw scores of scorched plastic bottles piled up next to the shoulder. An odd burnt laundromat smell hung in the air. 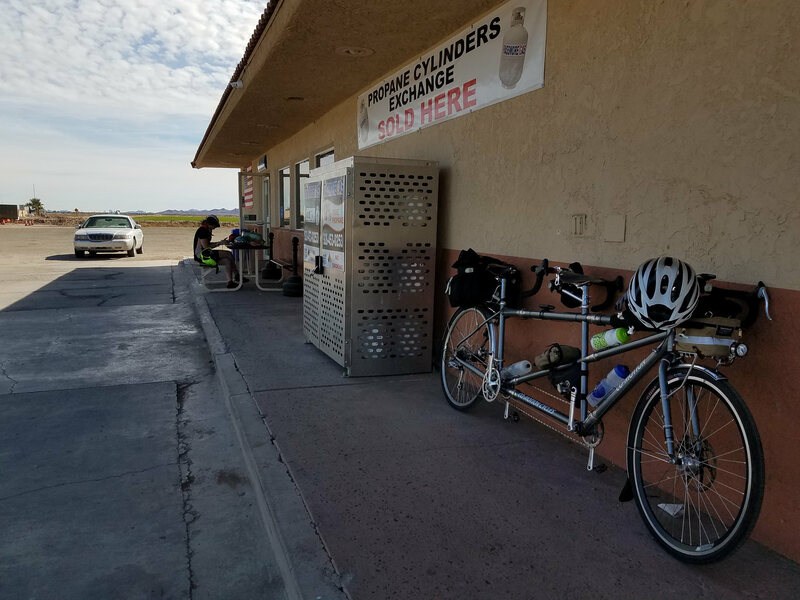 Once on US60, past the second summit at elevation 1,127 feet, we saw a gas station/grocery that was supposed to be closed but had re-opened, and another loaded touring bike was parked out front. 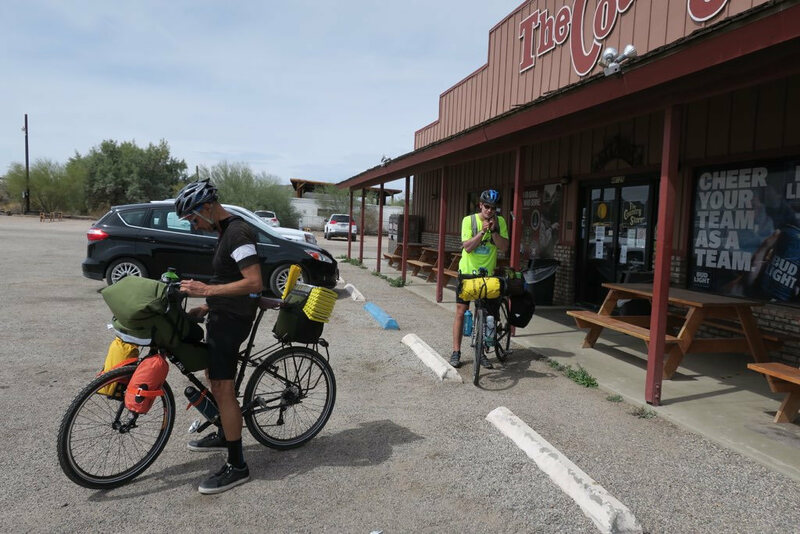 We pulled in and Jon arrived, and we went in to meet Rafael Torres, who was also riding from Los Angeles to Phoenix. He was on a Surly Troll decked out with cool Road Runner bags. Even though it was only mile 40, we went ahead and ate lunch, talking with Rafael and Jon. The grill in the store did a handy lunch and it was just a mellow scene, hanging out on tour with our new pals. Our trio rode out as a group and Jon got on top of the pedals to stay in the draft. We led because tandems belong at the front due to aerodynamics – headwinds are no match for two riders. The bigger challenge was the dull route. The road was was just one straight stretch after another. Gladly, the miles went by fast as we traded stories. Whipping off his helmet, it was a long-lost riding buddy of ours, Jeff Radan, who had left D.C. a few years ago. Turned out he lives in Phoenix when he’s not working abroad, and he recognized us. What a moment! We had totally lost track of Jeff, and here we were on a desolate stretch of back road in Arizona getting caught up. Our new riding pals had to wonder what else might happen this day! Jeff nicely offered his home to us and the guys and told us to call if we needed anything. Thanks Jeff, great to see you. Jon pulled off in Aguila, mile 77, where he had a Warm Showers host lined up. We stopped to say goodbye at the Family Dollar, where the local lady who rides her bike around with a pet ferret in a cage came out. She laughed enthusiastically at us. (Jon said she caused quite the stir in the store). 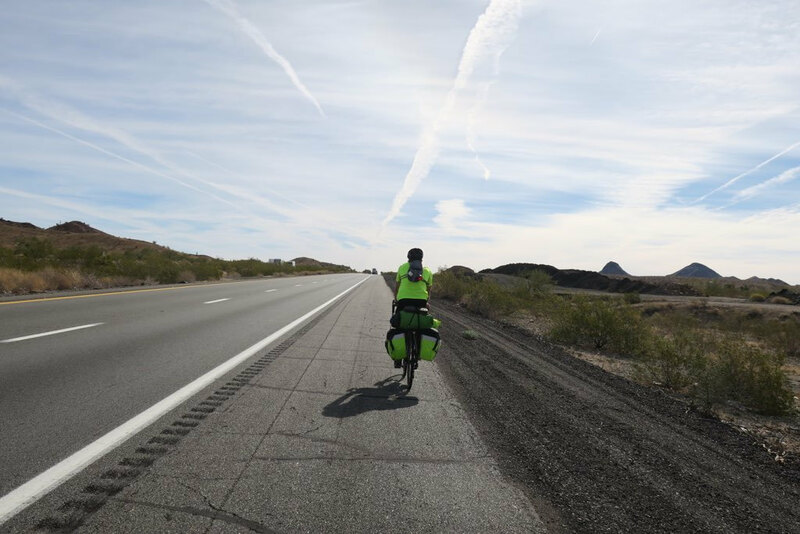 After some farewells, we continued on with Rafael on the dead straight US60. Our paces were different and he dropped back. The terrain finally included some turns as we ascended to a high point above Wickenburg at 2,640 feet, the last real summit of the trip. The afternoon sun lit up the desert. A fast descent into town was more than welcome. I braked to a quick stop at El Ranchero, a Mexican place on the right along the main drag. It had a full parking lot, which was a good sign. We looked for Rafael to join us but he flew down into town to his hotel (ours too, the Best Western). Enchiladas and cold drinks ensued, and we were happy. I thought we’d have more southwestern food during our tour, but this was our first Mexican meal and it was delicious. Wickenburg is known as a substance abuse rehab destination, though we saw few signs of that. The aging Best Western wasn’t the best, however. The outdated room had a lot of little problems, such as poor sound insulation, a lack of power outlets, some nonworking lights and a roach walking around the bathroom sink. We managed to get sorted out and still got a good night’s sleep. Staying at hotels on tour can be a mixed bag, and this one was the turkey of the trip. Distance 97.8 miles. Our route at Strava is here and our photos are here. Skipping the hotel lobby breakfast was an easy decision in favor of the McDonalds on our way out of town. Temperatures were moderate. Apparently a lot of other people like the local golden arches. The place was bustling, staffed with enthusiastic grown-ups who were running it like a diner, chatting with the customers. Another touring rider pulled in as we parked the bike, Derek Shepherd from Scotland, who invited us to sit with him and swap stories. He had ridden much of his way around the world on his English-issued Thorn flat bar touring bike, and was headed to see friends in south Florida. 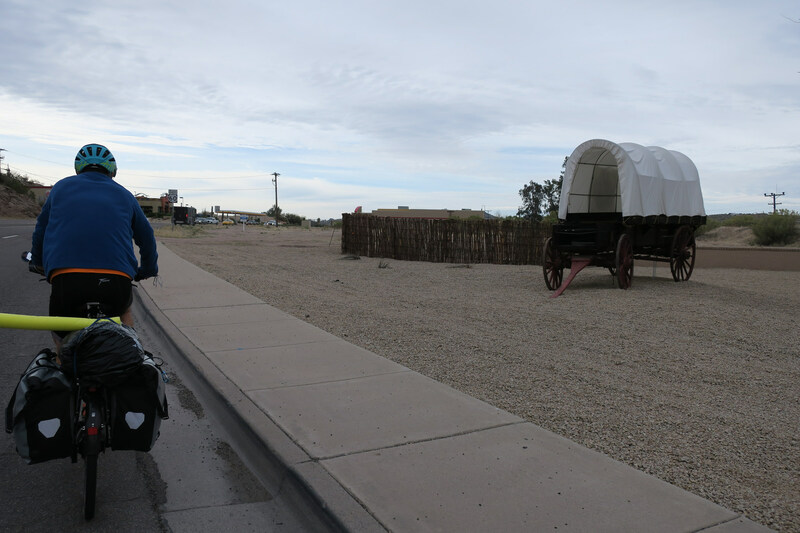 Derek had a refreshing attitude: he didn’t plan to ride from Phoenix to El Paso, having had enough of the desert, particularly after the straight roads to Wickenburg. He intended to get a rental car and drive. I thought the long days from El Paso east to Austin would still be pretty drab, but at least he would be out of the Arizona and New Mexico desert. Derek has traveled around the world via his bike and other forms of transportation, and spoke highly of Thailand as a standout. Derek’s method for getting locals in India to let him go to sleep was to make a declarative statement that everybody should go away, which he said worked and did not cause hard feelings. Derek also had a smart idea: he strapped a swimming pool foam noodle sideways across his rear rack, sticking a couple of feet out to his left. Drivers invariably swing wide to avoid the noodle. We may adopt this on narrow roads. As we mounted up outside McDonalds, Rafael rode by, and we signaled we’d chase. After a short climb out of town, the route today was gradually downhill into Phoenix around mile 28. The highway was busy but the shoulder was wide and we had no problems. Derek waved us on and we eventually caught up to Rafael, who accompanied us into Phoenix. We stayed on the main road, US60, which had a decent shoulder but was noisy with passing truck traffic. The Adventure Cycling route toward Tempe makes good use of the city’s bike path network to get across Phoenix. 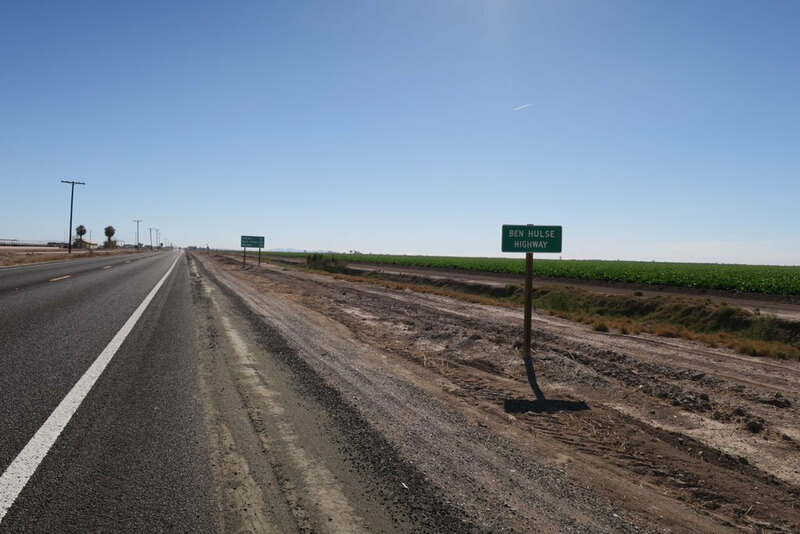 I had put the entire trip into our Garmin and we had no problem getting into the Phoenix outer areas, but we had to ride on a busy part of US60 in the city before turning onto 111th Street. 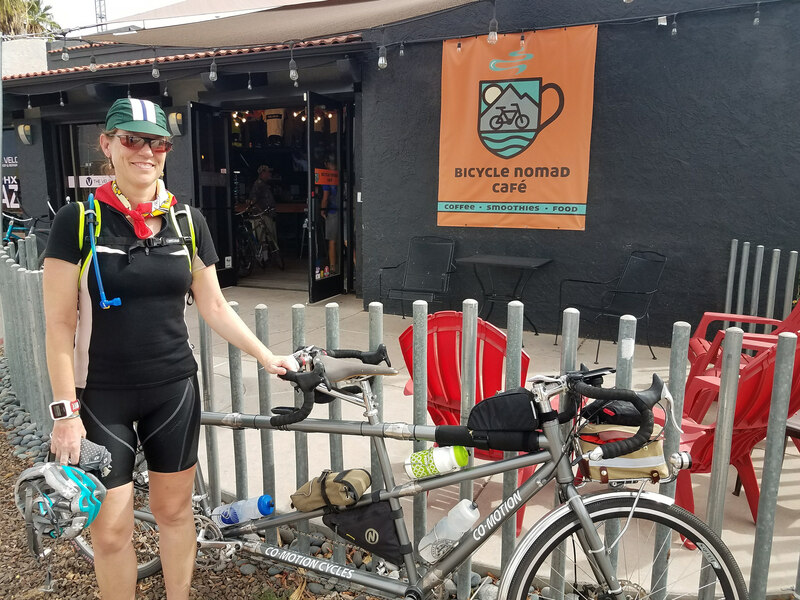 Rafael wanted to visit Erick Cedeno’s Bicycle Nomad coffee and sandwich shop in downtown, and so did we. In fact, it was one of our top reasons to ride to Phoenix after being able to visit family. Our plan to ride to the Nomad took us off our planned route, and after freestyling a bit we realized we were going in the wrong direction. We decided to send Rafael ahead on the re-route, as the tandem is slower in traffic, and headed for lunch at Lux Central Coffee Bar first. That was the right move. We were famished and overheated, and our navigation wasn’t the best. Lux was busy but we found seats and plowed through some awesome sandwiches and most welcome coffee drinks, the first good ones since we left L.A. Revived, we pointed outselves downtown to Nomad, where we had a super-relaxing time getting caught up with Eric. Mary met him previously and we have followed him on social media. Erick has ridden all over the world and now welcomes touring cyclists to his shop when he’s not building a riding community in Phoenix. 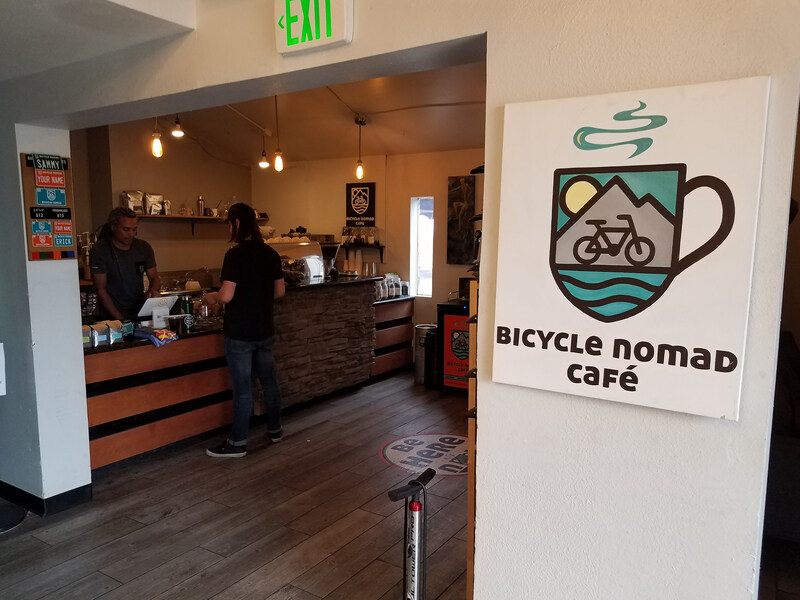 We made it to Bicycle Nomad! He also pulled me a mean espresso shot and took our photo for his Instagram feed. Yay Erick! We hope the Nomad just goes on and on. Interesting note: We just missed Rafael. See his Nomad photo here. Jon Muth also went to the Nomad during his stay in Phoenix. See his photo here. So, to recap: in the space of two days, we met and rode with two excellent companions, had a great interaction with another touring cyclist, met an old friend on the road, and spent time with all around nice guy Eric. And we still had our final arrival to come at my sister’s and her husband’s. I’ll say it again: good things happen when we get out and tour. The ride up to Scottsdale took a good two hours and involved a lot of turns and stop lights. We got back on our original route on the north side of town amid rush hour traffic, and zig-zagged via designated bike routes, with some improvisation to get off busy roads. We had a long stretch on East Shea Boulevard, almost five miles, but with three lanes and lighter traffic in our direction, we had no problems. A big tailwind helped too – we rode +20 m.p.h when we weren’t stopped at a light. Once we got on East Mountain View Road in Scottsdale, traffic quieted down, and we had an easy ride to my sister’s house. We were done! Our final total since we left our hotel in L.A. was an even 545 miles, spread over five days, with no rain, no flats and no mechanicals. Most of all, we had a great time with wonderful moments with fellow cyclists and family – truly a dream tour. Our flight home on Saturday went without a problem, and included a welcome visit to Cartel Coffee Lab at Sky Harbor airport, a final treat. Thanks to everybody who made this trip such a success! As with all our tours, the afterglow tends to lead to new ideas…and new plans.